Any ranch as big as the JA, will have good and bad pastures. The JA has an abundance of both. I am sure that Goodnight picked this ranch because of the canyons and the protection they offer in the winter. There are signs that the ranch had many more springs years ago. However, water in the Palo Duro canyon and the basin of the Prairie Dog Fork of the Red River has a high mineral content (cowboys call it gyppy). Cattle learn to drink it, but it is bitter to the taste and will purge your system. The most prominent feature of the ranch is Palo Duro Canyon on the southwest; however, in the center of the ranch there is a large plain. To the east are the rolling hills of Mulberry and Halls Creek. To the north is the Caprock. 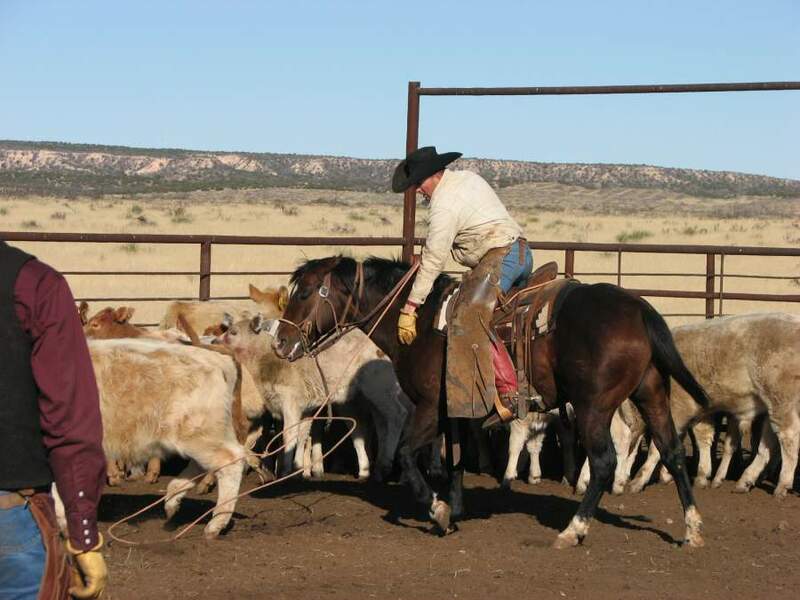 A ranch is an asset that must be maintained. In addition to practicing pasture resting and rotation, the JA is trying to control mesquite and cedar through grubbing spraying and controlled burns. It is our belief that the increase in cedar and mesquite is largely due to fire suppression for the past 125 years. While we do not believe we can live with indiscriminate burning, we do believe in controlled burning. Unfortunately, burns are dangerous and they always scare us. Beverly: One of the most frustrating pastures to gather on the ranch, Beverly has deep draws running the length of it. Even horseback, cowboys have to work to cross the draws. They are tributaries of Battle Creek (named after one of the last Indian battles of the Panhandle), which cuts across the southeast corner. The pasture has thick mesquite and cactus. It also has great grass in sandy loam and shallow redland soils. Bull Run: I never learned how to utilize this pasture. The canyons are deep and the water is sparse. Sometimes I think we should forget it, but it has 7,000 acres. Before I came, it was used for cows. The problem is that you have to drive the cows and calves up the road out of the canyon to brand and many of the baby calves have a hard time making it. Getting the weaned calves out of the canyon is a challenge, as well. We ran yearlings from March to July (when the blood sucking cedar flies attack the cattle) and then moved them to South Plains. If we got a pound a day, we feel fortunate. Campbell Creek: We utilized Campbell Creek as we utilized Bull Run. It is lower on the Bull Run Creek and has some flats where the canyon runs into the Prairie Dog Fork of the Red River. Tom Blasingame lived at the Campbell Creek camp until his death. Cottonwood: A gently rolling pasture that was completely taken over with mesquite before being sprayed in 1995. Prickly pear is also a problem in this pasture. Churchill: Churchill would be one of the best pastures on the ranch if it were not covered with large mesquite. Even with the mesquite, it produces lots of grass. It is where the county road turns south towards Brice off the county road between headquarters and Clarendon. Griffin Hills: When I arrived at the JA, the cattle had a well deserved reputation for wildness. We were gathering home raised heifers from Griffin Hills and they were pretty spooky. We got them through the mesquite on the north end of the pasture, but a batch of them turned and broke back over the cedar covered Griffin Hills. I headed out at a run through the cedars to head them. I finally got them turned and headed back east along the south fence. They were trotting along and I wanted to keep them on the fence; so, I loped up to let them know not to turn back to the north. Going through a bunch of weeds, my horse Dean stepped in a hole. I was thrown forward as he threw his head back to balance. His head was tougher than my teeth. Two of the front ones broke off. Dean didn't fall and we kept the cattle on the fence. Clint Esler repaired the damage. Griffin Hills is where the archeologists found the most evidence of the Indian Battles. One can still see where the army dug foxholes along the hills. The Indians were moving across the hills with the army in hot pursuit. After my experience with the heifers, I have great respect for the army. Tim, branding in Suckerrod Pens on Deuce Bigelow with Lower Plains in the background. Lower Plains:In 2004, we grubbed Lower Plains with a track excavator and it is now a beautiful rolling plains pasture. On the south end are the Suckerrod Pens, built to service Vat, Roosevelt, Cottonwood and Lower Plains and to replace the old Vat pens. Mulberry: Mulberry Creek runs through the ranch and provides water for five rough Juniper infested pastures. East and West Blasingame: West Blasingame is separated from East Blasingame by the canyon ridge. We run yearlings in these pastures for the spring and early summer. 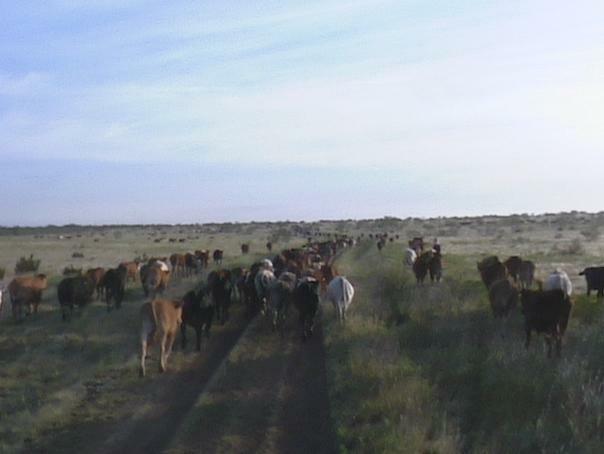 Cattle are pushed out of West Blasingame by the cedar flies and cross over the canyon rim. Gathering 1000 yearlings at Plains Corral (1/2 are already in the pens). North and South Plains: On the northeast corner of the ranch are deep hardland plains pastures on the top of the Caprock. They produce some of the best gains on the ranch. Small playa lakes cover these pastures. In 1998, we burned South Plains to try to control the encroaching mesquite. Summerfield: is another canyon pasture and we use it as we use Bull Run and Campbell Creek. It is a little better because there is a broad flat area half way down, we call the park. Summerfield also has an extensive gyp cave with water, bats and lots of guano. Walsh: is a small pasture to the southeast of headquarters. In 2000, we tried to address the cedar problem with a controlled burn. Normally, the rock pens at the headquarters are used just for horses; however, on a cold windy day the cowboys used it to stay out of the wind. Rhett Cauble prepares a loop. West Piercy: In 1999, the ranch just completed grubbing West Piercy. It is a flat, hardland soil pasture to the west of the Battle Creek pens. 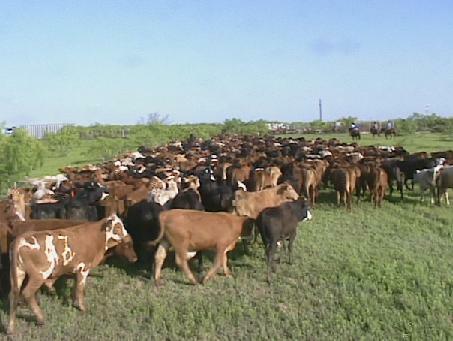 The ranch uses it to watch cattle closely after they first come in from the South East. Wylie Pens service the country along Mulberry Creek. They are east of the Davis Camp. 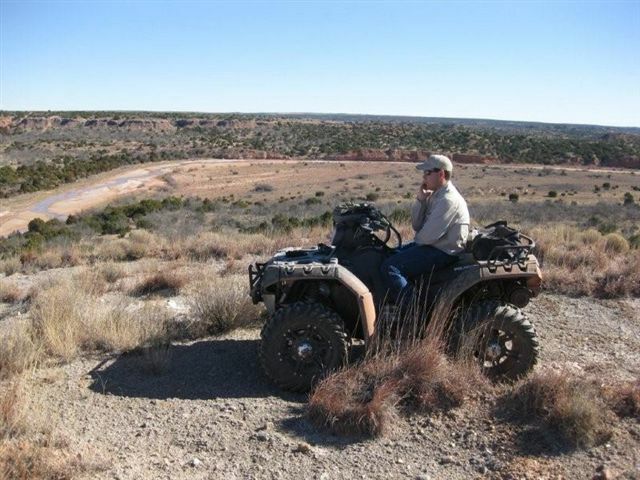 Hunting: Colorado wildlife, Spring Turkey Hunt, Quail hunting, mule deer & aoudad hunting, elk in Colorado, Texas Wildlife; Swamp hunting, White-tailed deer.